Soybean crops around the world have their own unique production cycles of planting, growing, and harvesting, all of which influence the price of the global crop. Grain prices tend to move the most during the growing season, as supply expectations can shift significantly depending on planted acreage, weather, and growing conditions. Crop disease and infestation can also play a role in the price volatility of soybeans each year. Listed below are windows of opportunity for planting and harvesting soybean crops within the largest soybean-producing countries in the world. Considering how much of our food is imported, it might come as a surprise which country is the world's largest producer of soy. The production percentages cycles below are important to consider when timing swing trades or making long plays. While soybeans are produced around the world, the most influential producer in the world of soybeans is the United States. Therefore, the U.S. crop is the key determinate of the price path of this important grain, and a number of factors can cause the price of soybeans to move. As soybeans are an agricultural commodity, the weather determines the size and condition of the crop. Soybeans can be stored, but the shelf life of inventories is limited, as soybeans deteriorate and lose nutritional value over long periods. In the United States, most soybean crops are grown in the Midwest and Delta regions. Typically, the southernmost areas begin planting first, and the northern areas begin planting as the snow melts, the soil thaws, and temperatures warm. The crushing of raw soybeans is a process that turns the commodity into soybean meal and soybean oil. Soybean meal is required for animal feed, and its oil is a key ingredient in many common food products. Additionally, soybean oil is used for cooking around the world. When demand for soybean products increases, it directly correlates into demand for raw beans. When the dollar is strong, U.S. soybeans are more expensive than beans from other nations, which makes U.S. crops less competitive against nations with weaker currencies. There is an inverse price relationship between soybeans (as well as other commodities such as gold and oil) to the U.S. dollar. Farmers have a choice in terms of the crops they plant on their acreage each year. Often, U.S. farmers choose between corn and soybeans. If corn is more expensive on a relative basis than soybeans, farmers tend to plant more corn. This often results in a smaller soybean crop, which is inherently bullish for the price of beans. When beans are more expensive, the converse tends to occur. The cycles are difficult to foresee, but soybean and corn are cyclical due to their competition. When macro forces cause an overall strong market for agricultural commodity prices, this tends to translate into price strength. During bear market periods, the converse is often the case. 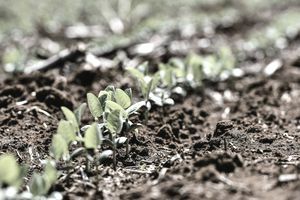 Many factors are at play when it comes to the price direction of soybeans each year, and as planting season gets underway in the spring, the eventual soybean crop yield in the fall is the sum of all of these factors. During the months that run from the spring to fall seasons each year, the price of soybeans can become volatile. Bumper crops are bearish, while shortfalls cause the price to rise. Soybean prices tend to be most volatile when uncertainty about the crop increases. In 2016, a palm oil shortage caused by weather issues in Asia and a smaller than expected South American crop caused the price of nearby soybean futures to rally from under $9 per bushel to over $12 during the planting season in the U.S.
A bumper crop brought the price back down to under $10 per bushel. In 2017, a surprise snowstorm at the end of April across many growing areas of the U.S. caused a brief rally. In these instances and others, weather plays a major role in price swings. Seasonal changes are perhaps the most influential factor when it comes to soybeans. Trading by the seasons, rather than the day or year, is often a good practice when investing in this exciting commodity.